Who's interested in playing for Florida State? The following articles are relevant to the Florida State men's team. 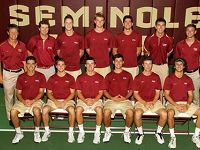 February may be short on days, but it was long on accomplishments, with three college indoor team champions crowned and six recent collegians earning ITF World Tennis Tour titles among the highlights in this month's Aces column. Major tournaments in college and junior tennis along with the usual Pro and Pro Circuit events made for a busy month of October, with 19 different competitors earning time in the spotlight last month. From the grass of Wimbledon to the U.S. hard courts, the top performances of the month of July include titles by current juniors and nearly a dozen current and former collegians. The NCAA Division I men's and women's tournaments get underway today at campuses across the nation. In Part 2 of our Roundtable, our panel provides a look at some potential dark horses and predicts which teams will be holding the trophy in the end.